Former super welterweight world contender Vanes Martirosyan of Glendale, Calif., is the first standout to join International Championship Boxing, promoter of the revolutionary and exciting new combat sport that features boxing in a cage. "Vanes is not just the first to sign a multi-bout, multi-year agreement with ICB, but he's also the first of several," says Jack Fulton, founder and Chief Executive Officer of the Virginia-based ICB. "We are in discussions with many boxers, mixed martial artists and kickboxers, and some of the names definitely would surprise," says Fulton. "It's more than interest, it's enthusiasm to box in 'The Fight Zone' says Fulton. "We've struck a chord with boxers and MMA fighters, and it's resonating." 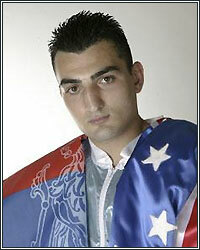 The 32-year-old Martirosyan, originally from Armenia, has a record of 36-4-1 with 21 knockouts. Martirosyan's most recent bout was against Gennady Golovkin on May 5 for "GGG's" World Boxing Association and the World Boxing Council middleweight championships, a fight he took on three-week notice. Martirosyan had two previous title bouts, one for the WBA super welterweight crown and another for the World Boxing Organization super welterweight championship. Martirosyan's first bout in the ICB cage will be during the first quarter of 2019. "I was surprised when I heard about boxing in a cage, but at the same time I was real happy," says Martirosyan. "The idea is just amazing. Fans are going to love it. "I'm going to be a nightmare in the cage," says Martirosyan. "It's easier to cut off the cage in a dog fight, and I'm an action fighter; I do bring the action. "I challenge all fighters in the world, boxing or MMA, to come into the cage with me, and I'll show them what real fighting is all about," says Martirosyan. "Vanes and his team are excited to be part of this new and unique concept for boxing," says his manager, Vince Carthron. "It's a format just made for Vanes, and we are delighted to be there at the beginning and helping to build it," says Carthron. "It's good for boxing fans, and it's good for Vanes." It took Fulton almost two years to get the cage designed, built, patented and approved by boxing and athletic commissions within the United States, including the state of Nevada. An 18 year veteran promoter of the sport, through the years Fulton began to realize the sport needed something new, something fresh. And in 2016 he did something about it. "The sport of boxing needed something revolutionary, and this is it," says Fulton. "The ICB cage better assures toe-to-toe, non-stop action, something that's appealing to both boxing and mixed martial arts fans, and to the new hybrid athlete that's proficient in more than one combat sport"
"We have no doubt ICB boxing in the cage will engage all ring sports fans," says Fulton. "'This is boxing for a new generation, a generation that has grown up watching combat sport in a cage. And that's the main reason we conceived, created and now launched the ICB. It will re-energize boxing fans and bring MMA fans who prefer stand-up striking." "Vanes gets it; he sees the future and the opportunity," says Fulton. "The ICB cage doesn't force a boxer or an MMA fighter to make a choice; it offers them flexibility."